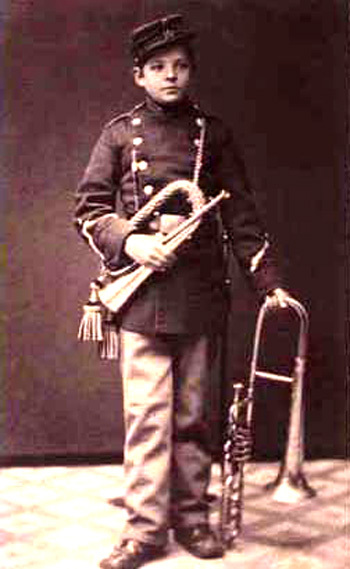 From 1 November 1879 to 31 December 1883 the teen-aged Carl Nielsen was employed as a bugler and trombonist in Odense, with the 16th battalion and the 5th regiment, respectively. In the long run his modest position in the military could not satisfy him, so he traveled to København to continue his musical training at the conservatory. However, in many ways his time as a military bandsman in Odense was a particularly good basis upon which to build his future. This according to “Spillemand Carl August Nielsen” by Ida-Marie Vorre (Fynske Minder 2008, pp. 49–63). Today is Nielsen’s 150th birthday! Above, a photograph from ca. 1880; below, Helios, op. 17, a work in which the orchestra’s brass section figures prominently.